You might not know its name, but if you’ve ever spent time in Chicago, you’ve probably admired the building at 111 E. Upper Wacker, otherwise known as One Illinois Center. New tenants are in luck — an aggressively priced sublease has just come available in the building. 111 E Wacker, the black building at center. This formidable structure stands with other storied properties that line the Chicago river and give the city its iconic big-shoulders vibe. 111 E Wacker, however, has a unique distinction: it’s located on the site of Fort Dearborn. This outpost, built in 1803, was the US Army’s westernmost post at the time, and effectively put the small encampment of Chicago on the map. From the site of Fort Dearborn, towering grain elevators would become the first skyscrapers, which in turn were eventually replaced by One Illinois Center. Don’t want to take Mayor Daley’s word for it? Then listen to Superman — in the 2016 movie Batman v Superman: Dawn of Justice, the lobby of 111 E Wacker was used for the set of The Daily Planet, Clark Kent’s employer. Up to 66,768 SF is available on the 15th and 16th floors, which can be divided for any size company or leased all in one. This aggressively priced sublease is priced at a below market rate of $20.00 per SF gross — almost half the downtown average. The sublease is ready for immediate move-in and comes fully furnished and wired with modern, sleek furniture and full tech capacity. The current sublease term is through July 2019, but an extended term is available direct with landlord. Without even leaving the building, tenants in this aggressively priced sublease can access a variety of amenities including a barber shop, laundry service, full gym, FedEx center, access to the pedway, and the Shops at Illinois Center. Potbelly and Sopraffina are on site as well. Located on the Chicago River, the building is in close proximity to the Riverwalk, as well as the bustling Loop neighborhood. Casual bites like Wildberry, Naf Naf, Sweetwater, Broken English, and Stan’s are just a short walk away. Taking someone out for dinner? The Loop has no shortage of upscale dining, including Shaw’s Crab House, Tortoise Supper Club, Stetsons, McCormick & Schmick’s, and Siena Tavern. 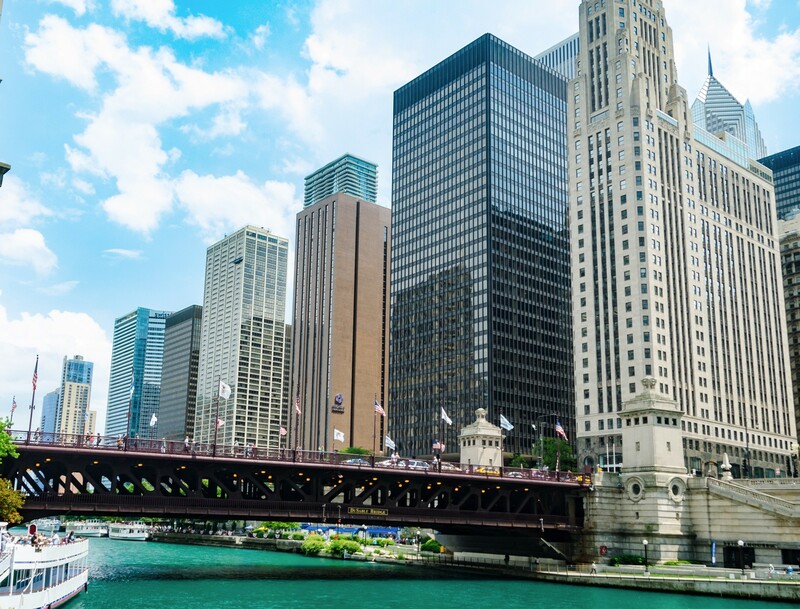 This historic buildings rubs elbows with landmarks like Millennium Park, the Wrigley Building, and the Michigan Avenue Bridge, and is just across the river from Pioneer Court and Tribune Tower. Tenants like Taft Law, the Chicago Architecture Center, Combined Insurance, Potter Bolaños, and the International Interior Design Association all make 111 E Wacker their home, and rumor has it that Amazon is even planning to open a Go store there. This aggressively priced sublease is perfect for any tenant looking for a great cost and easy move-in in the heart of Chicago. It won’t be on the market for long, so shoot us an email for details!